Because conventional light oil can typically be produced at a high rate and a low cost, it has been used before other types of oil. Thus, conventional oil accounts for a declining share of the Earth’s remaining oil endowment. In addition to assessing conventional oil resources, scientists of the U.S. Geological Survey’s Energy Resources Program collect data on the abundant energy resources available as heavy oil (including extra-heavy oil) and natural bitumen. The data in this Fact Sheet are compiled from commercial databases, unpublished government data, and the published literature. Stacked pair of horizontal wells for steam-assisted gravity drainage (SAGD), a natural bitumen recovery process. 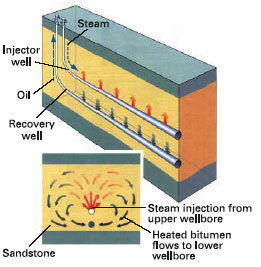 Steam injected through the upper well mobilizes bitumen, and gravity causes the mobilized fluid to move toward the lower well, where the bitumen is pumped to the surface. Graphic copyright Schlumberger "Oilfield Review"; used with permission. From Carl Curtis and others, 2002, Oilfield Review, v. 14, no. 3, p. 50.